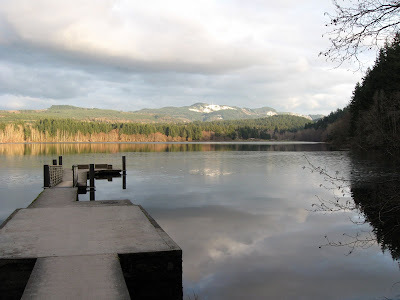 Started out as a bike ride till I saw a friend of mine walking around Lake Padden. I joined him for part of his walk. He takes long walks clear across town. I walked my bike and had a good talk. A bit of ice on water surface and snow on mountains reflected in water. Enlarge.